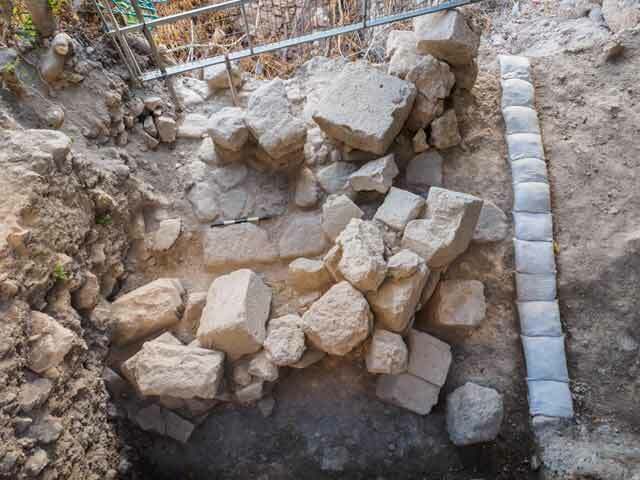 In May–September 2016, a season of excavations was conducted in the Giv‘ati Parking Lot in the City of David, Jerusalem (Permit No. A-7721; map ref. 22234/63128), prior to construction works on the southern and western margins of the site. The excavation, undertaken on behalf of the Israel Antiquities Authority and funded by the El‘ad Association, was directed by D. Ben Ami, Y. Tchekhanovets and S. Dan-Goor, with the assistance of N. Nehama (administration), V. Essman and Y. Shmidov (surveying and drafting), A. Peretz and M. Dinstein (field photography), D. Tanami (metal detecting), N. Zak and R. Brin (plans), C. Hersch (pottery drawing), I. Raznitsky (metallurgical laboratory), G. Bijovsky (numismatics), C. Amit (studio photography) and N. Yahalom-Mack from the Hebrew University (archaeometallurgy). Giv‘ati Parking Lot is located on the northwestern side of the City of David spur, along the eastern fringes of the Tyropoeon Valley, which delimits the spur from the west (Fig. 1). The excavations on the site in 2007–2015 revealed architectural remains in a stratigraphic and chronological sequence dating from the Iron Age to the Early Islamic period (Ben Ami and Tchekhanovets 2008; Ben Ami and Tchekhanovets 2010; Ben Ami and Tchekhanovets 2013). During the 2016 season, a small excavation area (c. 4 ´ 15 m) was opened in the southwestern corner of the Giv‘ati Parking Lot, returning to the initial areas that had been excavated (Shukron and Reich 2005) and Area M1 (Ben Ami and Tchekhanovets 2008). The excavation revealed architectural remains dating to the Byzantine, Early Islamic and Mamluk periods. The excavation ended with the exposure of Byzantine-period architectural remains, which have not yet been dismantled. Byzantine Period. 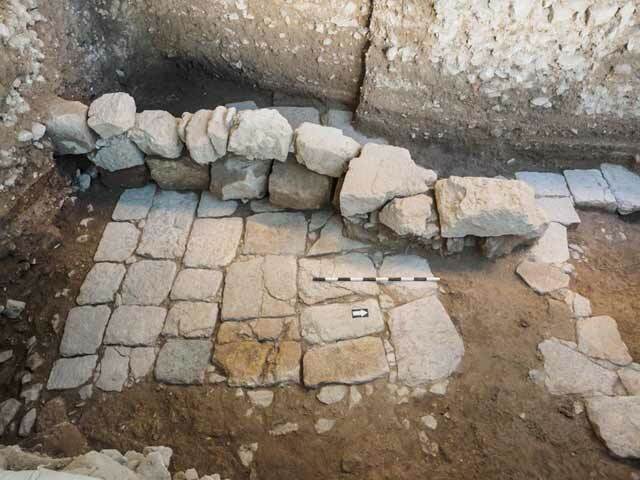 A section of a paved street oriented north–south from the Byzantine period was exposed (length 10 m; Fig. 2). It was paved with various sizes of stone slabs (0.4–0.5 ´ 0.4–1.0 m), smooth from long use. Curbstones delineated the eastern sidewalk of the street, paved with smaller stones. The western side of the street is located beyond the limits of the excavation area and therefore was not excavated. A section of an east–west drainage channel (length c. 5 m, width 0.4 m) covered with stone slabs was exposed under the street. 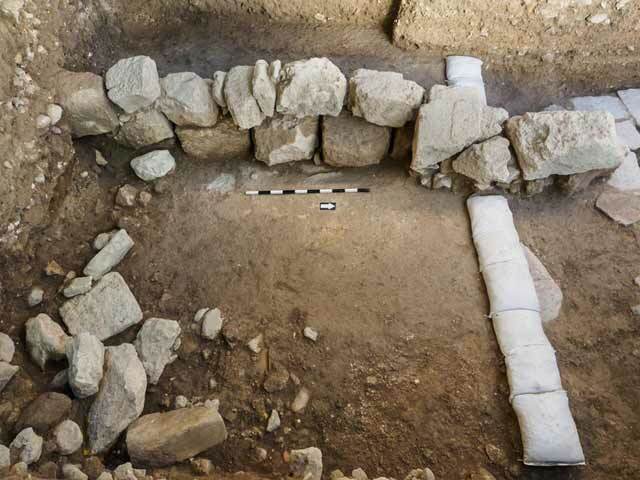 Most probably, this drainage channel served the structure constructed to the east of the street (unexcavated) and was connected to a main north–south drainage channel possibly running below the street pavement. Similar drainage channels were discovered during previous excavations. 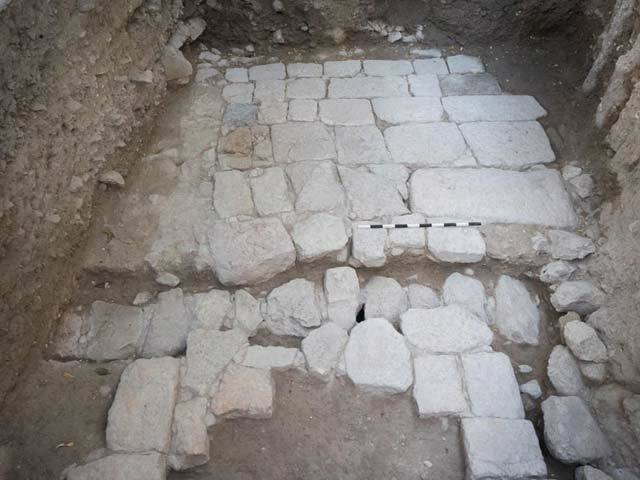 In the northern part of the current excavation area, an impressive destruction layer containing ashlars and numerous fragments of architectural elements was exposed directly above the paved street (Fig. 3). It seems that this destruction layer originated in the collapse of a Byzantine structure located to the east of the street, which was excavated in the past (Shukron and Reich 2005). At this stage, the destruction layer was not excavated. In previous excavations, additional sections of the Byzantine paved street were exposed south (Crowfoot and Fitzgerald 1929:41–43) and north (Ben Ami and Tchekhanovets 2010; Hagbi and Uziel 2015) of the excavation area. Apparently, this street was one of the main streets of Jerusalem in the Byzantine period, and served as an important pilgrimage route, connecting the sanctuaries of the city center in the north to the Siloam pool in the south (Tsafrir 1999:295–300, 321–323; Gutfeld 2011). 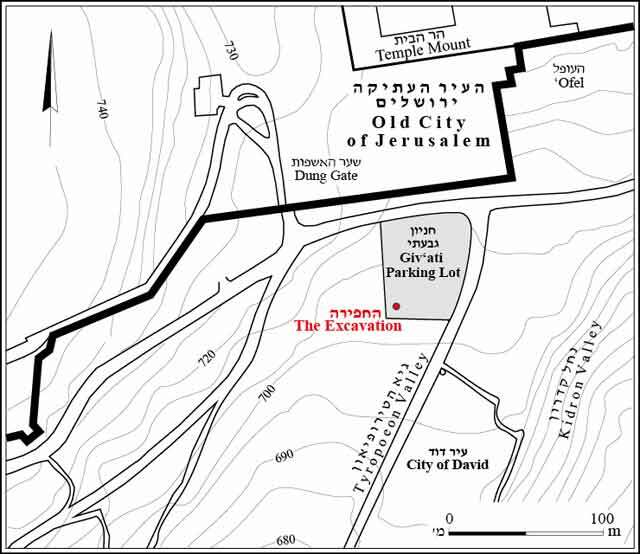 Following the topography of the City of David spur, the street sloped toward the south: there is a 4-m height differential between the section of the street exposed in the current excavation and the northern section of the street exposed in the previous excavation. Umayyad Period. During the Umayyad period, the entire area was turned into an industrial zone. The main south–north Byzantine street running along the Tyropoeon Valley most probably went out of use or was significantly narrowed. Some of the pavement slabs were damaged or entirely removed. A long, narrow wall built of well-dressed stones, clearly in secondary use, was revealed directly above the street (Fig. 4). Series of plaster floors, covering the original Byzantine pavement of the street, were revealed on both sides of the wall (Fig. 5). Among the most interesting finds from the Umayyad plaster floors were the remains of a small-scale metal workshop (Fig. 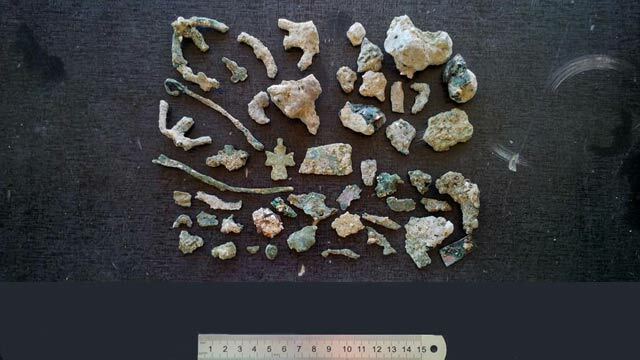 6) that operated at this place: numerous fragments of bronze and lead Byzantine vessels, some decorated with crosses (liturgical vessels), metal slags, pottery crucible fragments and production waste. It seems that the bronze liturgical vessels served as scrap for local craftsmen who recycled them for reuse. A similar transformation of the Byzantine street into an industrial zone during the Umayyad period occurred further north, where a large limekiln was excavated, probably connected with the large-scale construction operations carried out on Ḥaram el-Sharif at that time. A series of walls and plaster floors built over the original Byzantine pavement were exposed during the previous seasons at the Giv‘ati Parking Lot (Ben Ami and Tchekhanovets 2010) and further to the north (Hagbi and Uziel 2015). During later stages of the Umayyad period, the entire area was abandoned and covered with thick layers of alluvium (thickness 0.4–0.8 m). Abbasid Period. During this period, extensive building activity was discerned. The Abbasid remains revealed in previous excavation seasons are represented by three strata (III–I). The finds discovered in the current excavation were attributed to the two earlier strata (III and II). Earlier Stratum III, dated to the second half of the eighth century CE, is represented by a cluster of four refuse pits discovered in the southern part of the excavation area; two additional fragmentary, preserved pits were documented further north. All the pits (diam. c. 1 m) were dug in the ground, sometimes one into the other. They all contained burnt organic materials, charcoal chunks, charcoal, numerous fragments of various pottery vessels, animal and bird bones and egg shells. Dozens of similar refuse pits were exposed during previous seasons of excavation. These refuse pits may indicate that a large marketplace, consisting of stands made of perishable material, probably operated here in the open area. In Stratum II, dated to the late eighth–late tenth centuries CE, changes were made in the area. It became part of a well-planned and well-organized industrial area comprising mainly small-scale industries and crafts. This stratum consists of two stratigraphic phases (IIb, IIa), both represented in the finds of the current excavation. The fragmentary architectural remains include modest structures with walls built of small fieldstones and compacted earth floors, stone pavements, a fragmentary industrial mosaic and a large plastered installation and a rounded underground water cistern, which remained unexcavated. The poorly preserved remains and the limited size of the excavation area leave no possibility for detailed interpretation of the architectural remains. Mamluk Period. Only five refuse pits (max. diam. 1.5 m) dating to this period were revealed in the entire excavation area; most were only partially exposed. All the pits were sealed with piles of fieldstones and contained only few ceramic finds. These remains are meager and devoid of construction, like those discovered in the previous seasons. It seems therefore that during this period, there was only scanty activity in the area. The results of the current excavation supplement the information derived from previous years of research in the area, mainly contributing to the study of the city plan during the Byzantine period and its transformation during the Early Islamic period. The exposure of an additional section of the Byzantine street assists in our understanding of how the planners coped with the topographical difficulties of the area: the street was not built in steps, but gently sloped toward the south throughout its length. It seems that the destruction layer of the structure built along the street can be securely dated to the end of the Byzantine period, prior to the Arab conquest, supporting the previously proposed date of 614 CE (Ben Ami, Tchekhanovets and Bijovsky 2010). The most valuable finds, of the small-scale metal workshop dating to the Umayyad period, attest to the transition of the area into an industrial zone during this time. Ben Ami D. and Tchekhanovets Y. 2008. Jerusalem, Giv‘ati Parking Lot. HA-ESI 120. Ben Ami D. and Tchekhanovets Y. 2010. Jerusalem, Giv‘ati Parking Lot. HA-ESI 122. Ben Ami D. and Tchekhanovets Y. 2013. Jerusalem, Giv‘ati Parking Lot. HA-ESI 125. Ben Ami D., Tchekhanovets Y. and Bijovsky G. 2010. New Archaeological and Numismatic Evidence for the Persian Destruction of Jerusalem in 614 CE. IEJ 60:204–221. Crowfoot J.W. and Fitzgerald G.M. 1929. Excavations in the Tyropoeon Valley 1927 (APEF 5). London. Gutfeld O. 2011. The Urban Layout of Byzantine-Period Jerusalem. In K. Galor and G. Avni eds. Unearthing Jerusalem: 150 Years of Archaeological Research in the Holy City. Winona Lake. Pp. 327–350. Hagbi M. and Uziel J. 2015. Jerusalem, City of David (B). HA-ESI 127. Shukron E. and Reich R. 2005.Jerusalem, City of David, the Giv‘ati Car Park. HA-ESI 117. Tsafrir Y. 1999. Topography and Archaeology of Jerusalem in the Byzantine Period. In Y. Tsafrir and S. Safrai eds. The History of Jerusalem: The Roman and Byzantine Periods, 70–638. Jerusalem. Pp. 281–352 (Hebrew). 2. The Byzantine paved street, looking south. 3. Destruction layer above the Byzantine street, looking east. 4. The Umayyad wall build above the Byzantine street, looking west. 5. Umayyad plaster floor and wall, looking west. 6. Finds from the small-scale metal workshop.